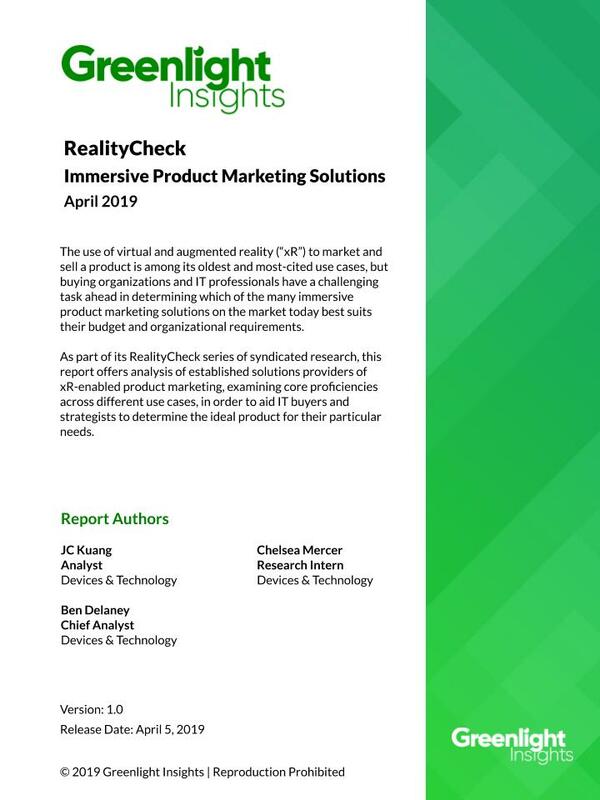 As part of its RealityCheck series of syndicated research, Greenlight Insights offers a first-of-its-kind analysis of established solutions providers of xR-enabled product marketing, examining core proficiencies across different use cases, in order to aid IT buyers and strategists to determine the ideal product for their particular needs. With VR rapidly approaching mass adoption and AR rounding the hype curve into general productivity, savvy virtual and augmented reality ("xR") stakeholders have begun to offer turnkey solutions which solve old business problems with new immersive technologies. The use of xR to market and sell a product is among its oldest and most-cited use cases, but buying organizations and IT professionals have a challenging task ahead in determining which of the many immersive product marketing solutions on the market today best suits their organizational requirements and constraints.